Real gross domestic product edged down 0.1% in September, following seven consecutive months of growth. Lower output across all goods-producing industries (-0.7%) was the main reason for the decline. The output of services-producing industries edged up 0.2% as growth in most sectors more than offset declines in wholesale trade and in finance and insurance. Overall, 10 of 20 industrial sectors declined in September. There was a 1.2% contraction in mining and quarrying in September. Oil and gas extraction fell 2.9% in September, the third decline in four months, as all types of extraction activities were down. Conventional oil and gas extraction was down 2.3%, more than offsetting the previous four monthly increases, as both crude petroleum and natural gas extraction contracted. Crude petroleum production in Newfoundland and Labrador was at its lowest level since June 2016, in part due to maintenance work at some facilities in September. Non-conventional oil extraction declined 3.6%, partly as a result of maintenance shutdowns at some facilities along with lower crude bitumen production in Alberta. Support activities for mining and oil and gas extraction were down for the fourth time in five months, contracting 1.6% as all types of support activities declined. Mining excluding oil and gas extraction increased 3.0% in September, led by a 9.3% rise in metal ore mining. Copper, nickel, lead and zinc mining output gained 24.1% after posting recent lows of copper and nickel production in August. Non-metallic mineral mining was down 3.2% as a result of a 5.9% decline in potash mining. Coal mining (+2.6%) was up for the sixth time in seven months on higher demand by export markets. The manufacturing sector declined 0.5% in September, down for the second month in a row. Non-durable manufacturing decreased 1.2%, while durable manufacturing was essentially unchanged. The decline in non-durable manufacturing was widespread as output decreased in six of nine subsectors. Food (-2.2%), chemical (-1.5%), and petroleum and coal products (-1.3%) manufacturing contributed the most to the decline. In durable manufacturing, the 10 subsectors were evenly split between increases and decreases. The largest increases were in transportation equipment (+1.0%), furniture and related products manufacturing (+3.9%) and miscellaneous manufacturing (+3.4%). The rise in transportation equipment was widespread as most subsectors were up. The largest declines in output were in machinery (-1.3%), computer and electronic products (-2.9%) and electrical equipment (-4.5%). The construction sector was down 0.6% in September, contracting for the fourth consecutive month. Residential construction was down for the fourth consecutive month, declining 1.0% on slower single, row and multi-unit dwelling construction along with housing alterations and improvements. Non-residential construction grew 0.4%, partly offsetting two months of decline, led by industrial and commercial construction. Repair construction (-0.4%) and engineering and other construction activities (-0.8%) were also down. Wholesale trade contracted 0.7% in September, fully offsetting the previous two months of growth. The largest subsector in terms of output—machinery, equipment and supplies wholesaling—was down 1.9% as the majority of its industries contracted. There were also notable declines in the wholesaling of personal and household goods (-1.7%) and food, beverage and tobacco (-1.6%). Farm products wholesaling declined 6.6%, coinciding with lower exports of canola and other crop products in September. Increased activity by wholesalers of building materials and supplies (+1.7%) and petroleum products (+2.6%) offset some of the declines in the sector. The transportation and warehousing sector expanded 0.9% in September, more than offsetting the 0.4% decline in August, as all subsectors rose. Postal services and couriers (+2.3%) led the growth in September, fully offsetting the previous three months of contraction. Warehousing and storage was up 3.0%, continuing strong growth that began in the second quarter of 2018. Truck (+0.6%) and rail (+1.0%) transportation were both up, but not enough to fully offset the decrease in August. Pipeline transportation was up 0.5%, as a 2.6% growth in pipeline transportation of natural gas more than offset the 1.4% decline in crude oil and other pipeline transportation. Retail trade rose 0.4% in September following three months of contraction, as most of its subsectors increased. There were notable increases at motor vehicle and parts dealers (+1.1%), general merchandise stores (+1.4%) and food and beverage stores (+0.5%). Activity at gasoline stations (-0.9%) was down for a fourth consecutive month, while a third consecutive decline was registered at building materials and garden equipment supplies dealers (-1.5%). The finance and insurance sector contracted 0.4% in September, following a 1.3% gain in August—the largest monthly increase since May 2017. 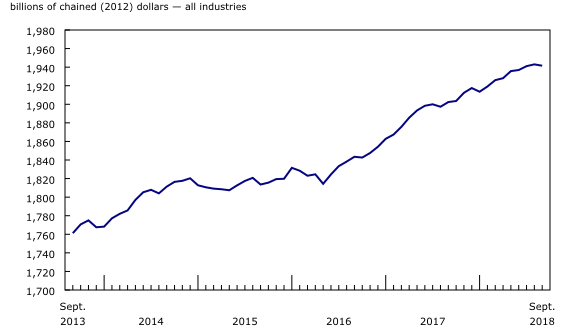 Financial investment services, funds and other financial vehicles contracted 2.9% in September, following a 5.8% expansion in August. Insurance carriers and related activities (-0.4%) declined for a fourth consecutive month in September. Depository and credit intermediation services edged up 0.2%. Professional services grew for the 15th consecutive month, expanding 0.5% in September. This increase was led by a 4.0% rise in legal services. The public sector edged up 0.1% with education and health care increasing. Accommodation and food services rose 0.6%, as both accommodation (+1.5%) and food services and drinking places (+0.3%) grew. Real estate, rental and leasing grew 0.2% as activity at offices of real estate agents and brokers increased 0.2% in September. Utilities edged down 0.1% following two months of growth, driven by lower output by the electric power generation, transmission and distribution subsector. Agriculture, forestry, fishing and hunting decreased 0.8% in September. The value added of goods-producing industries declined 0.2% in the third quarter, the first decrease following eight quarters of growth. The output of services-producing industries rose 0.7%. Overall growth was widespread in the economy, as 15 of 20 sectors reported gains. The main contributor to the decline in goods-producing industries was the 2.4% decrease in the construction sector, the largest decline since the first quarter of 2015. All components of the sector were down, led by a 3.4% decrease in residential construction. Mining, quarrying, and oil and gas extraction declined 1.4%. Support activities for mining and oil and gas extraction (-10.6%) and oil and gas extraction (-1.0%) both decreased, while mining excluding oil and gas rose 4.4%. Utilities (+2.3%) increased, with all components rising, led by electric power generation, transmission and distribution (+2.2%). Agriculture, forestry, fishing and hunting was down 0.2%. Manufacturing rose 1.4% as non-durable manufacturing was up 3.5%, while durable manufacturing declined 0.4%. In non-durable manufacturing, the largest increase was in petroleum and coal products manufacturing (+20.9%) as production conditions returned to normal after some maintenance shutdowns in the previous quarter. In durable manufacturing, most subsectors declined, led by transportation equipment manufacturing (-1.1%) and furniture and related products manufacturing (-4.8%). 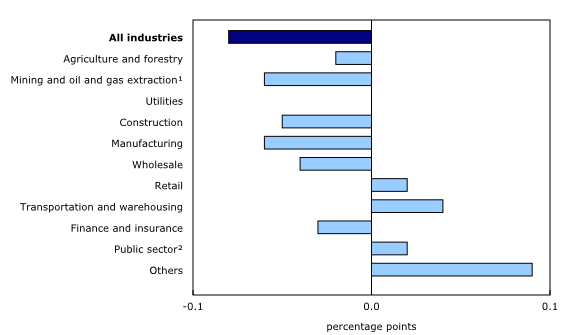 Among services-producing industries, the majority of sectors increased. The largest growth was posted by real estate and rental and leasing services (+0.9%), helped in part by a 4.2% rise in activity at offices of real estate agents and brokers, the first increase following back-to-back quarterly declines earlier in 2018. The public sector was up 0.6%, with the strongest growth coming from educational services (+1.1%) and health care and social assistance (+0.7%). Transportation and warehousing rose 1.1%, mainly on the highest growth in rail transportation (+5.6%) since the second quarter of 2014. Wholesale trade increased 0.6%, while retail trade edged up 0.2%. Arts and entertainment were down 1.3%, in part due to lower gambling activity and reduced attendance at sporting events. 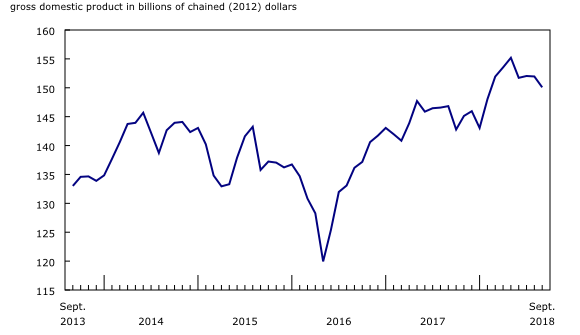 Effective with this release, the monthly gross domestic product (GDP) by industry data at basic prices will use 2012 instead of 2007 as the reference year for its chained volume estimates. This means that data for each industry and each aggregate are obtained from a chained volume index, multiplied by the industry's value added in 2012. Monthly data are benchmarked to annually chained Fisher volume indexes of GDP obtained from the constant-price supply and use tables (SUT) up to the latest SUT year (2015). Revisions have been made back to January 1997 to improve the continuity of the time series and achieve greater coherence with expenditure-based GDP. Real-time table 36-10-0491 will be updated on December 17. Data on GDP by industry for October will be released on December 21.